An ancient box is found, and its mysterious occupants released. They seem benign, the small, floating creatures freed from the box… until they begin multiplying. Until Guy, Saul, Emily and her ten-year old twins find themselves sucked into a whirlpool of terror. For the pretty little floaters have bonded them, and are taking something from them….and giving back something even more dangerous.  What they give back is new to the world. It is something three desperate mercenaries want, and will kill to get. Unable to negotiate with their murderous hunters, Guy, Saul, Emily and the girls find themselves fleeing for their lives. This description fits the book PERFECTLY. I wouldn’t add anything else to it as it covers it all without giving anything away. Saul, Guy and Gary are out on an adventure. They are always going on adventures and looking for treasure and new things. They happen upon a barn that has long since been abandoned and check it out. Inside is a massively heavy chest. They open it and some jellyfish-like creatures escape. Each guy has their own creature that attaches itself to them. They spend the night in the barn before leaving. The rightful owners of the box show up but the other three had already left. The two want their box back. They are willing to kill to get the box back and they want it badly. They have the unfortunate task of having to tell their third person the box is missing. Emily is twenty-six and has ten-year old twin girls. Abby and Annie are identical twins. Usually when an argument breaks out, it’s Abby who is the loudest and speaks her mind but recently Annie had. Emily is unsettled in being a single parent. She doesn’t feel connected to them the way she knows she should. She refers to them as the girls or the twins instead of my girls or my twins which most parents use when referring to their children. Guy and Emily are dating but haven’t been together that long. When Guy returns from his trip with Saul and Gary, he takes Emily and the girls on a four day camping trip. He wished he had a day off between adventures but he’s happy to be spending time with them anyways. Annie has a secret and she doesn’t want it to get out. Her hearing is failing her. Things always sound muffled. She can read lips if people are facing her but otherwise it is difficult for her to know what people are saying. On the camping trip, she thinks her eyes are failing as well because she keeps seeing this flash of color next to where Abby is standing in the stream and splashing her with water. She doesn’t want to be blind and deaf and only hopes her eyes aren’t really failing her. All this happens in the first couple of chapters! This is an amazing book. It is one of those books that you read in one sitting no matter how late it gets! Definitely recommend this book to readers! I received this book free from Curiosity Quills Press. 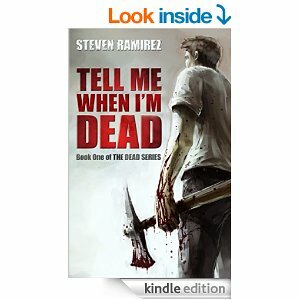 “Tell Me When I’m Dead” is the first book in the “Dead” series written by Steven Ramirez. 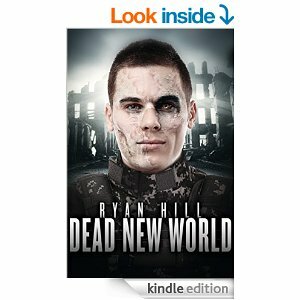 This is a zombie book. Dave Pulaski is a recovering alcoholic. He drank for 6 years and was always hanging with his friend Jim. Then one of his co-workers asked him out and things were looking up for him. He quit drinking, went to AA meetings and quit hanging out with Jim. One night, Jim shows up at Dave and Holly’s house, drunk. Dave drives him home but on the way, he swerves to miss a dog that was in the road. The dog was Jim’s dog that had gone missing a few weeks before though. And it looked dead. Dave had lost control of the car. His seat-belt and airbag saved his life while Jim went sailing through the window. He hadn’t been wearing his belt. Dave gets a ride back to town and to the police station. He files a missing persons report on Jim since he hadn’t been able to find him and calls Holly. Holly takes him to the hospital. Over the next few weeks, people become more and more demented. People were attacking others. Biting them and killing them. Then those would come back. First it took days and then hours and then moved to just minutes for the dead to turn. Dave and Holly separate because of some things that Dave admits. He escorts her to her mother’s house at the lake a short drive away from their hometown. After he leaves there, he encounters his doctor on the way back to town and rescues him. The disease is getting worse. The town is crawling with them. It is quarantined using an outfit called Black Dragon. Soon another group rises up to suppress the Black Dragons and zombies called hte Red Militia. But, they aren’t just going after zombies and Black Dragon forces. They’re going after everyone. This was a great book. It was NOT short on action or adventure at all. I loved reading this book. Once I started it, I did NOT put it down. I read it straight through until I was done. It was that good. I liked all the characters except a few and if you read the book, I’m pretty sure you can figure out who I don’t like. I’m sure your opinion would be the same as mine! 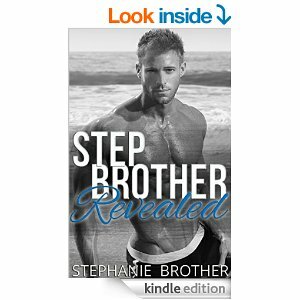 “Stepbrother Revealed” was a good read. Sienna HATES flying. She doesn’t like the airplane that she’s on because she thinks it is too rickety. Luckily there isn’t anyone sitting next to her so she won’t be forced to interact with anyone on the flight. Just as the flight attendant was getting ready to shut the door, to Sienna’s dismay, the last person boards. And his seat is right next to her. She is forthright with him and tells him that she’s no good with planes and to leave her alone. But Chase doesn’t listen. They start talking. They’re both going to the same island. And they’re both attending a wedding. They start talking and Chase asks her on a date. Sienna decides that she is up for some fun for her mini vacation that she’s having. So she says yes. When they get bto the place where Chase is staying, he gives her a few good orgasms. But then things get weird. People show up early that weren’t supposed to be there until the next day. Sienna leaves and goes to her hotel, resolving the fact that things aren’t going to work out in her favor because they never do. So she pushes Chase out of her mind and gets the shock of a lifetime on that weekend trip! I received this book free from Curiosity Quills Press in exchange for an honest review of the book. Sierra is a fairy keeper and she hates it. Her father is a dark alchemist and forces her to take more nectar from the fairies than she should. And she does it to keep her little sister Phoebe safe. One day, all the fairies, except the queen die after an earthquake. She knows that Jack, her father, is going to be beyond pissed when he finds out. Bentwood, another dark alchemist from two ports over, just so happens to be over that night for dinner and to talk business with Jack. Since there won’t be anymore nectar, Jack and Bentwood come to a new agreement. Sierra has two fortnights, or a month, to find a wild fairy queen and bring it back to the hatch. If she doesn’t have a fairy queen by that time, then Phoebe will go work for Bentwood. And Sierra really hates that idea. Jack calls on Nell, one of his runners and enforcers, to travel with Sierra as he doesn’t want her doing anything stupid while on the journey. Sierra’s first instinct is to go to Corbin, the other fairy keeper in the same port and the same age as her. They arrive to his hatch to find it empty and all the fairies except the queen dead as well. Corbin sets out on the journey with Nell and Sierra. It’s awkward between them because Nell likes Corbin and is jealous of the friendship between him and Sierra. Sierra doesn’t like Corbin in that way and soon feels like a third wheel when it’s obvious that Corbin likes Nell. Things go from bad to worse on their journey to find either their fairy queens or to find a while fairy queen. 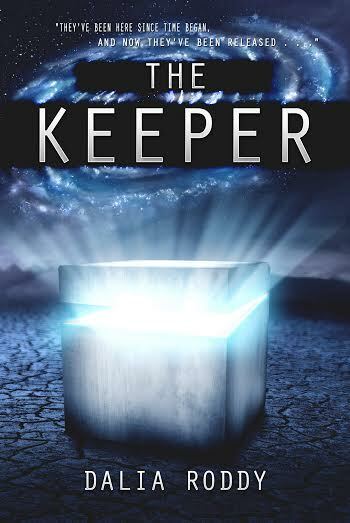 This book is packed full of adventure and fantasy. This book had me hooked from cover to cover. This book has it all. 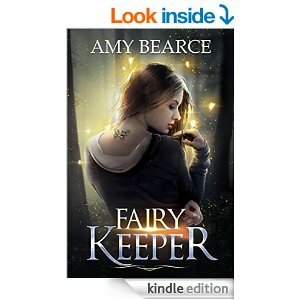 Adventure, fantasy, magic, romance and some action as well. Definitely a book I will be keeping in my library and returning to in the future! I must say that some spots took me by surprise as I had pictured the outcomes of a few things differently. Rosalie is crushing on the new hot guy at school. He started there the year before, he’s tattooed and he’s a bad boy. All the girls want him and he has a reputation in the school. Noelle, Rosalie’s best friend, and Rosalie like to spy on him and watch him when he’s outside smoking. Rosalie thinks she’s being sneaky but Shane knows that she watches him. He just doesn’t say anything to her. Rosalie lives with her mother and step-father Jim. She absolutely hates it there. She has no privacy, can’t talk on the phone without Jim listening in and she can’t hang out with her friends. She even has time limits on how long she can be gone with her own father. Rosalie knows that Jim is a creeper and her mother knows how she feels about him. But her mother always sides with Jim. When Rosalie finishes high school she gets a job. Even though she’s paying rent, buying groceries and helping pay on their credit cards, she still has no privacy in the house. She put a lock on her door and it ticks Jim off something fierce. She refuses to give him a key and he ends up taking the door off the hinges in retaliation. So what does Rosalie do? She moves in with her father and his wife. Did I happen to mention yet that her father’s wife’s son is the hot guy from high school? Oops. I seemed to have forgotten to mention that before now. Things went wrong one day at school and Shane (hot guy) ended up going to jail for four months. He moves in with his mother, Rosalie and her dad when he is released. Things get weird between them pretty quickly. 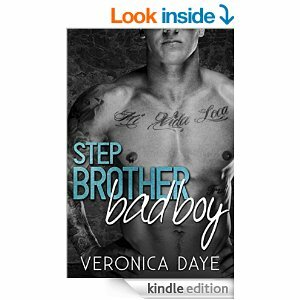 Rosalie wants nothing more than to forget about her stepbrother and to quit having all the thoughts she has about him. But it’s hard when you’re living in the same house. How does she forget him? Or does she? Is she able to handle her feelings and keep things semi-cordial between them? Why did Shane go to jail? What is the true reason that Rosalie hates Jim and has nightmares about when she was littler? I bought this book for 99 cents on Amazon. It sounded like a good book. I was NOT disappointed in reading this book. I loved it. I’m not a HUGE romance fan but I do read them. This one is definitely keeping its place on my Kindle and will be revisted from time to time. I received this book free from Curiosity Quills Press in exchange for an honest review. I LOVED reading this book. It’s pretty much a given that any book dealing with zombies is one that I’m going to love. And I really, really liked this book. The book starts out with Holt and Ambrose, who are best friends, when they are going out on their first mission. Everyone that was in the group ends up dead except for Holt and Ambrose. A horde of zombies had attacked but they were being led by The Reverend. He was a man that many people had rumored about but no one really knew if he existed or not. Holt has a leg blown off by a mine and Ambrose is bitten by one of the zombies. A prosthetic leg is made for Holt. Holt is in and out of consciousness for four days before finally waking up. His first concern is finding out Ambrose is. The nurse, Nancy, let’s Holt know that Ambrose is still alive but a doctor from DC was flying in to examine him. Ambrose still hadn’t turned into a zombie. There were rumors of people who were half human and half zombie, those that survived the zombie bite. Fort Bragg falls to the dead meat as the zombies are called. There are still survivors and standing when Ambrose, Holt and a couple others are ordered to go check on another station. Things go from bad to worse for the team on the way there. Only Ambrose, Holt and Baker make it out of the helicopter being shot out of the sky. There is so much stuff going on in this book. I love it! I really hope there is a sequel to this book so we can find out the few loose ends in the book. If you read it, I’m sure you’ll feel the same way! 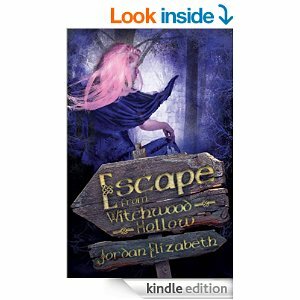 Jordan Elizabeth is a new writer to me. I received this book free from Curiosity Quills Press in exchange for an honest review. This is the blurb that accompanies the book on Amazon: Everyone in Arnn – a small farming town with more legends than residents – knows the story of Witchwood Hollow: if you venture into the whispering forest, the witch will trap your soul among the shadowed trees. At first we start out following Honoria who we learned about in the description above. She is in art class which they are having outside. This is her first day at the school and one of the girls is already being mean to her. And then they decide to scare her with their legends of the witch that lives in Witchwood Hollow’s forest which is right by the high school. Honoria sneaks out that night and goes with the two girls to the woods. They dare her to walk in and before she can think about it, she’s moving and then she’s walked farther than she had realized when she snaps out of the fog she was in. She swears she heard someone calling to her and her alone in the forest. After that, we start to follow a few other people who manage to end up in Arnn and other parts of the country. They are all connected somehow, but how are they connected? What’s up with all the missing people that enter the forest? Is the witch really a witch or just someone who was lonely and old and everyone painted her as a witch? To find out the answer to these questions and more, you’ll have to read the book. I found it easy to read Honoria’s chapters. But when it was following other people, I had issues trying to keep everything straight. It clearly stated who each chapter was following but after a while it got confusing trying to figure out what had happened to whom. A good book over all though and I do recommend it to fellow readers. 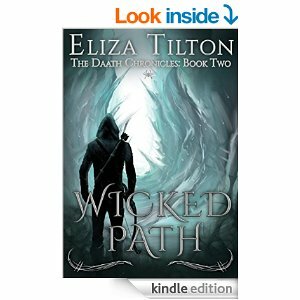 “Wicked Path” is the second book in the “Daath Chronicles” series by Eliza Tilton. My review of the first book “Broken Forest” can be found here. We rejoin Avikar, Raven, Jericho, Jeslyn and others in the second book. Avikar is still living with Raven, Jericho and Anna. Avikar is cautious when he goes to town because he is an outsider and no one can know that he is from across the veil. But one girl knows and he becomes a little paranoid about it. One morning while he’s at the market picking up a sword he commissioned, Lucy attacks him. Lucy was in the first book and is Lucino’s sister. Lucino is the prince that had kidnapped Jeslyn and made her fall in love with him. Meanwhile, Cael returns. Cael has been gone for five years and is Raven’s best friend. She gets so excited when she hears his laughter mingling with Jericho’s. It wasn’t until the next day, when Avikar is leaving that he learns that Cael is one of The Order’s priests. Cael promises to get Avikar out of Taartaniya and somewhere safe before Lucy can find him. Jericho wants Avikar to stay and fight there but Avikar doesn’t want to risk anyone he loves. Raven decides she’s going on the journey with him. We learn that Jeslyn had returned home but then left and is staying with her grandfather. She needed time to heal and her parents and Derreck weren’t understanding of that. Her grandfather was and she finally found peace with him. Lucino is on her mind a lot but she is finally able to mostly forget about him and how their relationship was a lie. Lucino is still alive but is biding his time. He has a friend make up a locating spell that will locate Jeslyn if she still has the locket he gave her, which she does. He is able to watch her and get a general location of where she is. The spell isn’t exact but is within a few miles of where she is. This book is awesome. All that I mentioned above is within the first couple of chapters! There is so much that goes on in this book. I like this book better than the first! 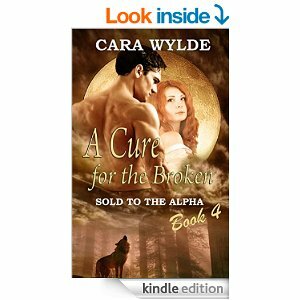 Avelyn, Max and the others return in the fourth installment of the “Sold to the Alpha” series by Cara Wylde. We know from book three that Avelyn was bitten by Sabine to turn her into a wolf so that she couldn’t have children and couldn’t give Max what he wanted most. But Sabine was wrong. What Max wants most isn’t children, it’s Avelyn. He truly loves her. A doctor comes and checks on Avelyn to make sure the wound is healing properly, which it is. He also learns a small something and tells Max, Jocelyn and Karl before Avelyn. Max tries to tell Avelyn but he just can’t so the doctor ends up telling her. She’s pregnant. There is a 98% chance she’ll loose the baby when she turns for the first time and a 2% chance that she won’t but that’s not to guarantee the baby would be healthy if it survived. Avelyn bans them all from her room, especially Christine. We all knew Christine was up to something but just not sure what. I still think she has something up her sleeve that hasn’t come out yet. (But that’s just my opinion.) Later, after Avelyn calms down, her and Max talk. She discloses everything from the time she was brought to the Schloss up until she was bitten. Max understands why she did what she did and only blames himself because he wasn’t forthright with her. Later, he comes clean and fills her in on the truth about Sabine and why she was locked up. We also learn that people are going missing from towns close to where the Schloss is. But things are in the works. Also, we learn of a possible cure for people who were bitten by shifters. This is a good book. I sure didn’t expect the few twists that were thrown in there.